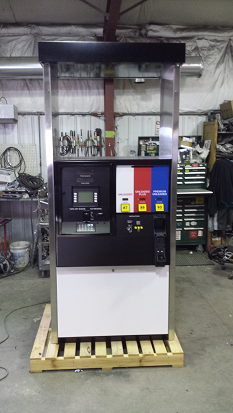 Used and reconditioned gas pumps, gas station consoles and EMV Upgrades. Gilbarco, Wayne, Tokheim, Gasboy, Bennett, VeriFone Ruby, G-site, and more across the nation and to foreign countries. Let us know what you are looking for. We'll help you find it! Encore NN1- This wide frame blending unit is capable of 5 blended grades. High product and low product blended with 1 hose per side. 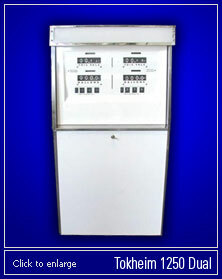 This unit can be equipped with or without card readers. Also available in a suction pump. Advantage B21L- Used for Marina, Airport and commercial sites. This unit will accept card readers. This unit also is available in two products, single sided or two sided. Suction units are available. All outer panels are stainless steel. 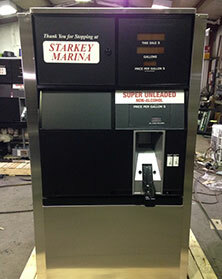 Single product single sided dispenser price $4575.00. Suction pump price $6900.00. 5% Discount on each L dispenser if ordered by March 31, 2016. Tokheim 1250 Dual - This mechanical unit can be purchased as single or dual hose unit and as either a suction pump or dispenser. These units are non-blending and can not be equipped with a credit card reader. "United Petroleum Equipment Co., Inc does not represent, distribute or have any affiliation with Gilbarco, Tokheim, Wayne or any other manufacturer named on any of our pages. The use of these names are for reference purposes only."